Tickets are on sale now to see King Lear at the Golden Theatre on Broadway. 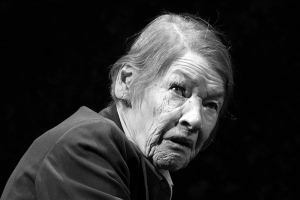 The incomparable Glenda Jackson triumphantly returned to the New York stage in the 2017-2018 Broadway season, after an almost thirty-year absence, to star in the Broadway premiere of Edward Albee’s 1994 Pulitzer Prize-winning drama Three Tall Women. Her tour-de-force performance resulted in her winning her first-ever Tony Award, although she had previously earned Tony nominations for each of her previous four Broadway outings. Experiencing this British stage and screen veteran once again treading the New York boards was viewed as a once-in-a-lifetime opportunity by many and few expected to be in the position to relive that opportunity in consecutive seasons. However, to the delight and surprise of those same theatre aficionados, a Broadway return for Ms. Jackson was announced at the end of June 2018 and she would be taking on the title role in William Shakespeare’s epic tragedy King Lear in an all-new Broadway production, courtesy of Scott Rudin. Indeed, the critical response was unanimous and she went on to receive her fourth Olivier Award nomination in 2017 for her efforts. For this new Broadway production, Ms. Jackson is joined by a stellar cast of stage veterans and screen favorites with the likes of Golden Globe winner and Tony Award nominee Ruth Wilson playing Cordelia, Tony Award winner Jayne Houdyshell as the Earl of Gloucester, and Tony Award nominee John Douglas Thompson as the Earl of Kent to name just a few. And under the steady hand of Tony Award-winning director Sam Gold, this revival could well be one for the ages. “When we are born, we cry that we are come to this great stage of fools.” – King Lear. The New York Theatre Guide encourages you to visit this great stage of players, with a crowning performance by Tony and two-time Academy Award winner Glenda Jackson as performances begin at the Cort Theatre on February 28, 2019. Written during a period of great social upheaval, Shakespeare’s brutal masterpiece is arguably the greatest tragedy ever written. The fatal consequences of a foolish decision are explored in haunting poetry to create one of the most moving works in the English language. Tony & two-time Academy Award winner Glenda Jackson returns to the Great White Way tonight as the Broadway revival of William Shakespeare's King Lear begins previews at the Cort Theatre. An official opening is set for April 4, with the strictly limited engagement running through to July 7, 2019.